This is the first game in the Arkanoid series. For other games in the series see the Arkanoid category. 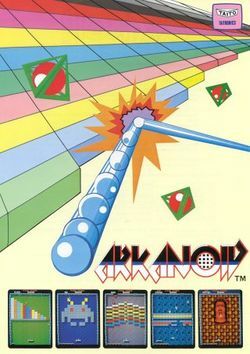 Arkanoid is an arcade game developed by Taito in 1986. Arkanoid is an update of the early ball and paddle video games — and specifically of Atari's 1978 classic, Super Breakout — in which the player takes control of a paddle at the bottom of the screen and must use it to deflect a ball into rows of bricks at the top of the screen, thus destroying them and, eventually, clearing the screen to progress to the next level. As well as impressive and colourful graphics, Arkanoid introduced a number of new elements to the classic bat 'n' ball gameplay. Certain bricks, when destroyed, release a power-up — in the form of a falling capsule. The player has to "catch" the capsule by touching it with the paddle (in this case, termed "Vaus") to retrieve the power-up and acquire its effects. Among the many enhancements the power-ups provided were an increased paddle size, multiple balls, a "sticky" ball (which would stick to the paddle and could be released when the player chose) and even a laser attachment that allowed the player to shoot the bricks. Because of the game's popularity, Arkanoid was ported to numerous home consoles and computers. In addition to a large number of unauthorized clones, four official sequels of the game were developed: Tournament Arkanoid, Arkanoid: Revenge of Doh, Arkanoid Returns, Arkanoid DS in 2007, and Arkanoid Live! for the Xbox Live Arcade in 2008. Taito has announced plans to release Arkanoid Plus! for the Wii in 2009. American flyer for the game. The era and location that the game takes place in is unknown. 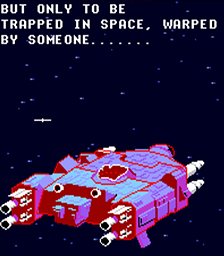 The mothership of Vaus, which is called Arkanoid, is destroyed, leaving the spaceship to escape on its own. However, it is trapped in space, warped by an unknown entity. It can be presumed that this entity might be DOH. This page was last edited on 7 April 2012, at 13:33. This page has been accessed 28,038 times.